How much of the gap between women's representation in DoD and that in the CLF is attributable to the high proportion of veterans rather than to other workforce characteristics? How would expectations for women's representation in the future change if policy changes or other broad trends were to reduce the level of hiring of veterans? To indicate where barriers to equal employment opportunity might be amenable to personnel policy changes, U.S. Equal Employment Opportunity Commission regulations direct federal agencies and departments to compare their workforce demographics with those of the civilian labor force (CLF). Persistent discrepancies between employees who work for the U.S. Department of Defense (DoD) and those in the CLF prompted a formal analysis of these workforce differences and potential barriers. This report represents an exploratory effort examining the relatively low level of women's representation and testing the utility of alternative methods in better understanding workforce dynamics. Many longstanding policies explicitly favor employing veterans in the federal government. The fact that most veterans are men creates the possibility of a trade-off between goals for employing veterans and Equal Employment Opportunity Commission workforce demographic goals. The researchers for this study assessed both static and long-run representation with changes in hiring practices, as well as with varying retention levels. The proportion of employees who are veterans is the primary contributor to the explained portion of the gaps in women's representation between the DoD civilian workforce, the non-DoD civilian federal workforce, and the CLF. The high proportion of DoD employees who are veterans contributes to the gap in women's representation between the CLF and both DoD and the non-DoD workforce; the latter gap is smaller than the former, though, because the proportion of non-DoD employees who are veterans is less than half that in the DoD workforce. New hires who are veterans are much more likely than nonveteran new hires to be men. However, female employees had lower continuation rates than male employees had, which could also tend to reduce women's representation under a given level of hiring in the long run. Hiring nonveteran women is insufficient to replace retention losses. Substantial changes in hiring veterans are necessary before projections show either prevention of a long-run decline or numbers in line with those for the relevant CLF. If the proportion of new hires who are veterans stays the same but women's representation among nonveteran new hires increases, a majority of nonveteran new hires need to be women before projections maintain the initial level of women's representation over time. The changes in the composition of the DoD workforce that would be required to reach the relevant CLF benchmark could also have secondary impacts that planners should investigate, such as whether veterans possess certain skills or experiences that are uncommon among nonveterans and difficult or costly to develop internally. An alternative to focusing on a single factor might be to take an incremental approach across the areas of recruiting, onboarding, and retention. In this vein, the best path forward for DoD planners seeking to increase women's representation would be to identify feasible policy changes in each area that address representation gaps, and then assess the projected representation levels under each policy change using workforce projection techniques. Policymakers would then be able to weigh the costs of these changes against the potential benefits in terms of gender diversity. This research was sponsored by the Office of Diversity Management and Equal Opportunity in the Office of the Secretary of Defense and conducted within the Forces and Resources Policy Center of the RAND National Defense Research Institute, a federally funded research and development center sponsored by the Office of the Secretary of Defense, the Joint Staff, the Unified Combatant Commands, the Navy, the Marine Corps, the defense agencies, and the defense Intelligence Community. 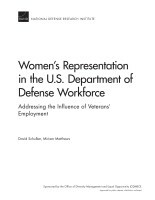 Schulker, David and Miriam Matthews, Women's Representation in the U.S. Department of Defense Workforce: Addressing the Influence of Veterans' Employment. Santa Monica, CA: RAND Corporation, 2018. https://www.rand.org/pubs/research_reports/RR2458.html.